Use High Desert ethidium dropper bottles and de-staining bags for improved safety and convenience when handling this potentially dangerous material. Ethidium dropper bottles from High Desert BioScience offer a safe and efficient method for the addition of ethidium bromide to solutions and gels, for nucleic acid staining. 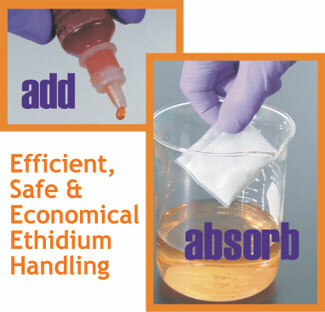 No more handling of potentially hazardous ethidium powder or concentrated solutions. The dropper bottle ethidium solution is pre-calibrated for quick addition and safe handling. Simply add one drop per 50ml solution for a 0.5 ug/ml final concentration. In addition, our dropper bottles are virtually spill-proof and feature a secondary containment vial for added safety and protection from ethidium damaging UV radiation. Institutional, industrial and municipal waste water regulations often require the reduction of liquid ethidium levels prior to disposal. Previous decontamination methods have been costly, inconvenient and even hazardous. High Desert BioScience de-staining bags are a safe and efficient method for the removal of ethidium bromide (also Coomassie Blue and other dyes) from solutions and gels for easy disposal. Simply drop an absorbent bag into your solution and let stand overnight. In 12 hours the bag will typically remove 99% of the dye from a 0.5 ug/ml solution. The destaining bag, with the tightly bound stain, can then be easily disposed of as a chemical waste, greatly reducing the volume of haz-mat waste and converting it to a solid form for more efficient handling. Under most institutional regulations the de-contaminated solution and gels can now be disposed of as non-hazardous waste. REA-1014 Ethidium Bromide dropper bottle - convenient way to dispense this dangerous reagent. Stock solution of 0.625 mg/ml.